I find the concept of time to be fascinating. It seems like such an arbitrary standard. Yet somehow, the entire world has adopted a consistent standard for it meaning and measurement. In a macro sense, at least on Earth, we can measure time by the passage of four seasons. Native Americans measured time by moons. Even on a daily basis you might think about time as broken up in daytime and nighttime - but depending upon your latitude that standard isn't very robust. At some point early mathematicians figured out how many days were in a year and broke up those days into hours, and so forth. You could use the position of the sun to estimate the time of day and the position of stars to assess the time at night. But have you ever pondered how the term "watch" come about? Beats me... but I wonder if it has a connection to the tradition of mariners. Sand-filled hour glasses could be used to accurately measure the passage of time and indicate when a change in "watch" was called for. Every half-hour a bell would be rung and once you reached 8 bells it was time for the next watch to come on deck. Perhaps that's where the term "watch" comes from? Accurately measuring time is critically important to accurately navigating. Recording the angles to certain stars at different times will yield the change in your relative position... if you can accurately measure time you can also assess your speed. Knowing your speed, direction and where you are is critical to navigating to where you want to go. Of course, making sure everyone on board has the correct (and same) time is also important. That's where the US Navy Comparing Watch comes into play. 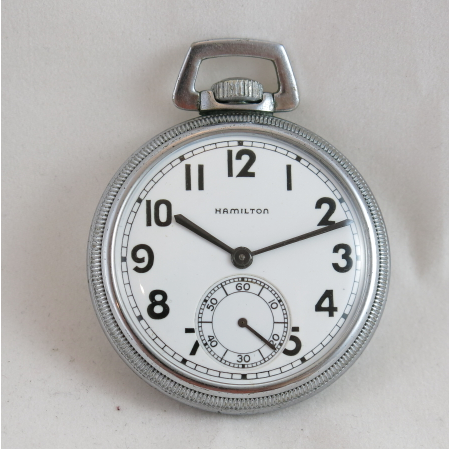 You may recall a post from last October on Hamilton's Model 22 Marine Chronometer. This very large deck watch was the official standard of time for the ship and was very carefully maintained. Although it would run for 60+ hours, it was customary to fully wind it with every change in watch. Every marine chronometer came with a comparing watch. The comparing watch was synchronized to the ship's Marine Chronometer and the comparing watch was used by the Navigator or his assistant (called the Quartermaster), when they left the bridge to take measurements. It would also be carried throughout the ship to ensure than any other clocks onboard were precisely set to the exact same time. 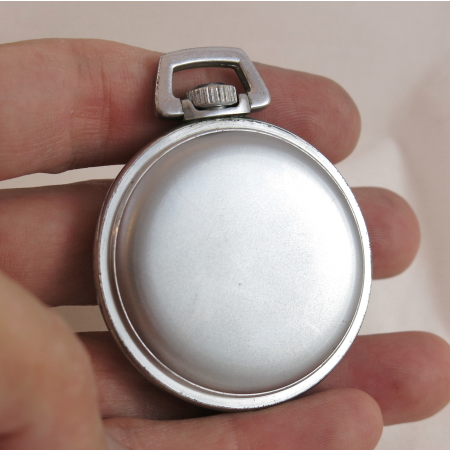 I recently picked up a Model 2974B Comparing Watch and it looks pretty much like your basic 16 Size Hamilton pocket watch. This watch has a white porcelain dial with black figures and the black hands are called the baton style. 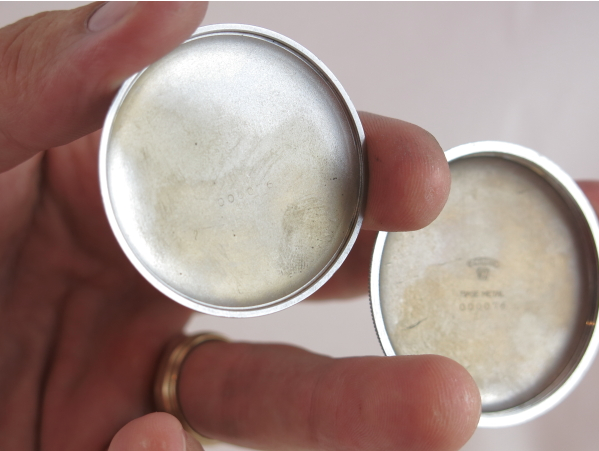 The case back will often show different engravings, depending upon how it was used. This one is clearly marked Bureau of Ships (aka BUSHIPS) along with US Navy Comparing Watch. The circle with the N inside stands for the US Naval Observatory followed by a contract number (I suspect) and the year 1941. A comparing watch should have a dust cover under the back cover. This is often missing and it's very desirable to have the correct cover with the watch. Under the cover you'll find the 17 jewel, 16 size 2974B movement. 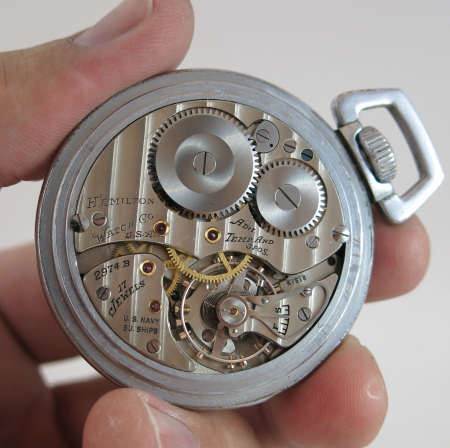 This movement is very similar to the 21 jewel 992B and, in fact, shares a number of the same parts. It's also very similar to the military 4992B, which has 22 jewels and a center sweep second hand. The 2974B basically doesn't have all the same cap jewels. However, like the 4992B, the 2974B is a hacking movement and will stop when you pull out the crown to set the time. You will often find different engravings on the movement - and the engravings can add to the collector appeal of the watch. For example, although this movement says "US Navy BU SHIPS", it will sometimes just say US GOVT or not say anything at all. It could also say "Elinvar" above the Hamilton on the barrel bridge - although that is quite rarely seen. so what are they worth? Depends on condition... the best way to determine value is to look on eBay for "sold" listings. Based on a quick look there are prices ranging from $175 for watches in need of repair to well over $400 for better examples. 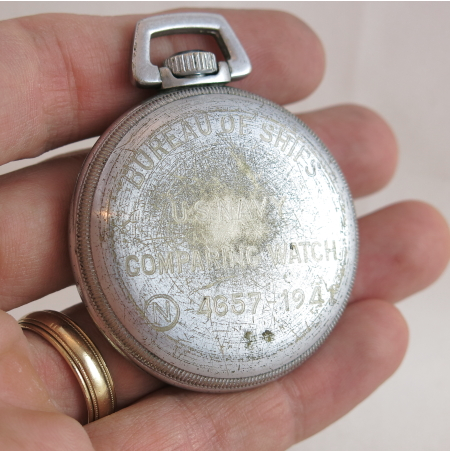 That watch is very cool...I have a 1942 deck watch from the LCI my father commanded during WWII, but I never knew there was such a thing as a "comparing watch." I am just starting to collect watches a little, but have no real interest in pocket pieces. Still, it would be nice to have a companion piece to the deck watch, now that I know there is such a thing. I am curious about what I would call the "furling" (not knowing the watch-people's term yet) of the bezel, which I assume is there to provide a better grip to unscrew the watch face. I had found this feature in a Hamilton watch online, and have it on order--I think I was unconsciously reflecting my love for the deck watch, which of course has something very similar. The watch I ordered is usually described as a Hamilton Khaki Field Pioneer, which seems a conflicted mouthful, as I have a couple of Hamilton Khaki "field" wrist watches, very plain bezels, and was reading the ad copy for a couple different watches claiming to be "Navy" watches and claiming to harken back to the famous deck chronometer. What is curious is their bezels were just flat plain and didn't seem to reflect the deck watch at all, whereas the Field Pioneer seems quite clearly to do so...any thoughts? Hamilton's WWII military wrist watches had smooth bezels but other military model makers, specifically of the A11 watch, had bezels with "reeding" (like on the edge of a coin). I'm not sure if there's a proper term, maybe it is "furling"? Regardless, that look is reminiscent of some WWII-era field watches. The non-gimbaled version of the Model 22 Marine Chronometer has a reeded bezel though - and looks like the Field Pioneer in a lot of ways - or vice versa. The Field Pioneer line has been discontinued but there are a few other Pioneer models in the current line up that are also reminiscent of Hamilton's WWII heritage, specifically the gimbaled Marine Chronometers. They are very sharp looking watches too. I like the Field Pioneer models and they have different colored dials to choose from. I have one of the chronograph versions. It's a nice blend of vintage and modern styling. I specifically like the cathedral-style open spade hour and minute hands the most - as they are definitely very vintage looking. There's one big difference though... modern Hamiltons are HUGE in comparison to their vintage ancestors. If you have a small wrist (under 7") you might find them to be too large. Knurling: they're called knurls, or the bezel is knurled. Pops off. Just slip a case knife under the lip. Great, thanks! What a beautiful movement. It is even more captivating in person than in the pictures.